The city of Yogyakarta is not only fun as a place of education. However, there are many other exciting things that can be used as attractive destinations for vacation, culinary, sightseeing and so on. Well, that’s why in this city there are lots of curious visitors visiting this city. For example, in Yogyakarta, it is now famous for one new tourist place, namely Little Korea or a Korean-style vacation spot. Many things you may concern when you live in Yogyakarta Indonesia. You can make it happen at Chingu Cafe, Yogyakarta! At this cafe, there is a hanbok shop that can turn you into a Korean princess in minutes. Various colors and sizes are available here, so don’t be afraid there is no hanbok that suits you. Invite your child and partner to wear the hanbok too so that you look like a happy Korean traditional family. After wearing a hanbok, you will feel a sensation of adventure back to the time of the Jonseon Dynasty. With this dress, don’t forget to take a photo in the “Bukchon Hanok Village” so that the traditional nuance gets thicker. The reasons why you must visit Yogyakarta. This replica of Dongdaemun Street at Chingu Cafe will make you feel like you are in Korea. Like the original Seoul City Landmark, along Jalan Dongdaemun, you can find photo backdrops inspired by Korean small shops. Everything is decorated with Korean-style neon signs and signposts so it is suitable for fun photography. Of course, this road is never empty of visitors like its original state, so get ready to take out your street photography skills! Posing in front of a vending machine or directions look cool. Besides Dongdaemun, you can also find duplicates of other Seoul iconic spots, the Cheonggyecheon River. Which is one of the interesting facts of Little Seoul in Yogyakarta Indonesia? Even though you are prohibited from playing water here, this Cheonggyecheon River at Chingu Cafe will give you an idea of how fun and modern Seoul is. This is a great spot to relax and self-serve while waiting for food to be served. When exploring this clear river, you will be greeted by pink goose buoys that have become permanent residents and everyone’s favorites. And at the end of the river, you will even find a stone bridge that is exactly the same as the original in Seoul. Hence the souvenirs that must buy in Yogyakarta. Entering the main door, you will immediately be taken to Chagiya Korean BBQ, where family and friends gather while enjoying delicious grilled meat! By ordering a Korean-style BBQ here, you will be served a plate of seasoned meat, several choices of sauce, and banchan, side dishes on a small dish. If you want to hang out happily with friends and family, then don’t miss the comfortable and Instagrammable indoor café here! Besides being able to taste super-small Korean desserts, you can also find posters and chairs filled with cool Korean idols. It will be a perfect spot to take a selfie yet fill up your hunger. Chingu cafe is quite a unique concept of restaurant that have Korean culture as well as the tastiness of their food. 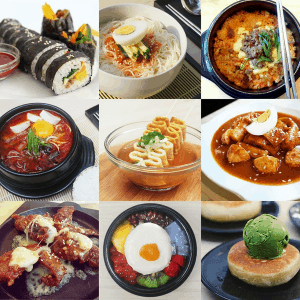 Chingu Cafe will take you around Korea through the image and taste of their food. The mandatory menu tried here is the All-in-one Mozza BBQ. This Korean-style BBQ is equipped with 3 different types of meat and you can bake it yourself then wrap it with melted Mozzarella Cheese. As a companion, there are also several types of vegetables and chilies to wrap meat wrapped in cheese, do not forget to dip it first into their special chili sauce so that the taste is more stable and delicious. You will be finding the best hotels in Yogyakarta Indonesia. 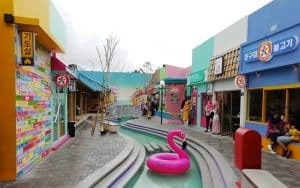 Furthermore, the interesting facts of Little Seoul in Yogyakarta Indonesia are cosmetics and other items. It’s no secret that beauty products in Korea are favored by millennials. Cosmetic products from the country of ginseng are indeed always a bone of contention because the quality does not disappoint and the shape is super mini and cute. Here there are various masks with a Line theme that will make your face smooth like a Korean artist. And who says masks are only for girls, guys at affordable prices. One interesting place not only for you and also for food. But it is very comfortable to spend on vacation with family because there are many beautiful spots, a fun restaurant is also a pleasant family gathering place. So, when you are on vacation with your family in Seoul, you will feel that you are in the real city of Seoul. So, try to feel a holiday together with your beloved family while enjoying the atmosphere and typical food of this Korean country style. You will be curious about it. The popular food in Yogyakarta you must try it. Besides being attractive as a vacation destination for couples, families are also fun for children. There are many interesting and fun playgrounds, children will feel safe and also comfortable being there. Choice of rides to take pictures play also places to eat provided for children as well as complete families. So, no wonder if you and your family, especially children, are on vacation there, you will feel the sensation of an unforgettable vacation. So, enjoy and feel the joy with your beloved child and family. The other interesting facts of Little Seoul in Yogyakarta Indonesia are the shades of a colorful, authentic and unique building, similar to the original. The buildings are made in such a way as to attract many visitors so that those who come are satisfied, comfortable and also fun to be able to take pictures. Korean-style and modern building styles combine to add to the place to make visitors feel at home. So, when you visit, don’t forget to go to every building that is suitable for a selfie. The refferences you must do activities in Yogyakarta that so fun. There are many buildings in Ginseng State that will be seen from the first time you enter a tourist location. Not only that, but there are also various typical South Korean menus offered. Starting from ramyun, tteokboki, ramyun, and many others. You will feel at home here, especially for South Korean lovers. You can take pictures, hang out or enjoy the beauty of interesting tourist attractions that are also beautiful. There are mini rivers that flow beautifully to make the atmosphere so romantic and cool. The affordable ticket price, automatically makes visitors spend a lot of weekends to enjoy delightful Little Korea in Yogyakarta. The affordable tickets make visitors curious and want to enjoy a different holiday than usual. In addition to cheap entrance tickets, it turns out the food menu available in that place is quite affordable. There are many variations of a typical Korean menu that can be enjoyed with relatives, spouse, and family, plus when the holiday is more fun to enjoy it. An amazing history of Malioboro Yogyakarta you have to know. Clean tourist attractions are also neatly arranged, each shop or building is made so similar to the original. There are also various public facilities available for visitors such as parking areas, restaurants, places of worship, toilets and so on that support the convenience of visitors. Well, this is also the case with an explanation of the interesting facts of Little Seoul in Yogyakarta Indonesia. It is expected that the following article can be your recommendation for visiting and seeking information about Little Korea in Yogyakarta.